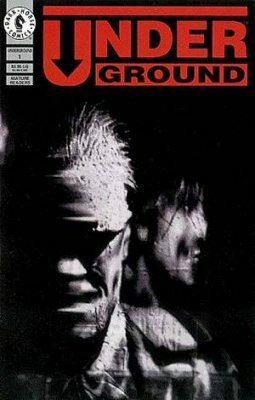 Dark Horse Brings Us Andrew Vachss’ Underground! DARK HORSE ANNOUNCES ANDREW VACHSS UNDERGROUND! ANNAHEIM, CA – APRIL 18 – Acclaimed author Andrew Vachss hits home with an unapologetic approach guaranteed to leave readers with plenty to think about. From the hard-boiled crime and suspense of the anthology series, Hard Looks, to the powerful and poignant Another Chance to Get it Right: A Children’s Book for Adults, his work continues to challenge the norms of prose. Dark Horse is proud to present Underground, a work of “speculative fiction” with a clear connection to current events…particularly how such events are presented in the media. Based on the script of the same name by Andrew Vachss, the book is adapted by Chet Wiliamson and Mike Richardson, with art by Dominic Reardon! When all sources of “news” are so clearly biased that none can be considered even remotely trustworthy or reliable, there is no news . . . and “The Terror” descends. For decades, The Rulers have been using prisoner and slave labor to construct Underground, confident that all those who flee there will willingly trade their freedom for security. Now, “truth” is what the Rulers say it is, and The Rulers rule all aspects of the human existence. But even within this antiseptically evil world, a revolutionary movement is brewing. A new breed of journalists— “The Book Boys”—risk everything to graffiti the truth on Underground’s pristine walls. The intolerable act of creating a reliable source of truth––“If it’s written in blue, it must be true.”––is against The Rules ––a huge bounty has been offered for identification or capture of any of this crew. This original graphic novel will challenge readers to reexamine the way the media governs their own lives, in print, on air and online, with a chilling account of willingly-accepted oppression and individual autonomy for the comfort of fascism! Underground is a new genre: the Graphic Novel presented as a visual Movie, adapted from the original screenplay of Andrew Vachss by Mike Richardson and noted author Chet Williamson. Find the truth––and what it costs to those who dare to disseminate––it at finer comic shops everywhere on October 29 in a beautiful hardcover edition of Underground priced at $29.99!